Do you #GiveACup about Hot Dog Eating Contests? Chicken + Waffles Chips, Recipe Coming Soon! Dad and I: #BestMates In Food + Foolery! ***I am a member of the Collective Bias® Social Fabric® Community. This shop has been compensated as part of a social shopper insights study for Collective Bias® and Neptune Retail® #cbias #SocialFabric All images and photos are original content copyrighted to Momma Told Me Blog, 2013. Momma Told Me: Life's richer with a little dairy. I'm addicted to dairy, and so is Jay; even if he shouldn't have it in large quantities, that doesn't stop the constant craving for something melty, milky, or creamy. Which is precisely why we buy Lactose Tolerance tablets in bulk, but that's a tale for a different post. The point here is that we love dairy so much, like a moth to the flame, it doesn't tend to stick around in our house very long. Even worse, I've not only resorted to stockpiling great sales on Sargento shredded cheese and other Everyday Dairy staples, but I've come to learn how to hide my own stash of sliced snacking cheese from grubby little dairy thieves (aka Jay and Sabrina). I could tell you I happily munch on mozzarella strings to reduce my risk of Type 2 Diabetes, or make a warm Gouda Cheddar Ham Melt to get my daily requirement of Calcium, but these would just be enabling excuses for the underlying problem. That's right, I have a problem. It's not normal for a family to consume dairy in the alarming quantities we do! From an early age I craved dairy, though I can't recall a time Momma ever bought milk higher than 2%. I always found it odd, even when Pop began watching his cholesterol, how the only dairy product she would skimp on was the actual dairy itself! Naturally, I've adopted these habits within my own family. We keep Soy and 1% milk on hand at all times, only buying heavy cream and whole milk for cooking or homemade cheese projects. But our cheese, which we love so very much, is always completely in tact, in all it's dairy glory. 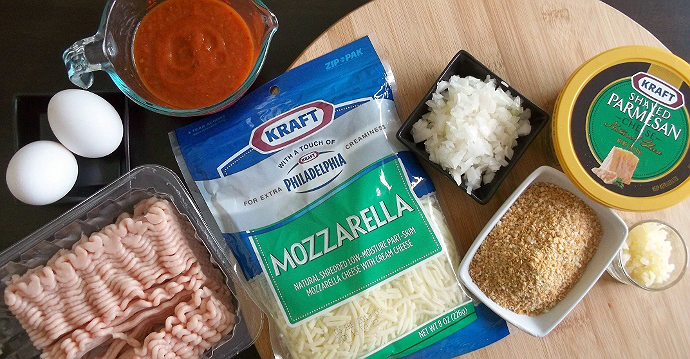 You name it and we likely have it on hand, from Philadelphia Cream Cheese to Kraft Snack Slices and Kraft with Touch of Philadelphia Shreds, even fresh made Alfredo Sauce and bricks of Velveeta. We're not cheese snobs, but we usually have a few 'premium' cheeses on hand too, like fresh shaved Parmesan and Havarti. Dairy never goes to waste in our household, but I'm still left scrambling to stock up when the sales come around. This week a month long sale kicked off at our local Vons (and Safeway affiliate stores nationwide; Randall's, Tom thumb, Pavillions, etc). Featuring revolving bundles of the hottest dairy brands and products, each week special items will be advertised as part of a Buy $15, Save $5 promotion. This means you can enjoy the exclusive Safeway sale prices and stack the savings by shaving an additional $5 off your purchase total, instantly, when you purchase $15 or more of the participating dairy items. I'm not ashamed to tell you we have 8 bags of Kraft Shredded Cheese in our freezer at this very moment, a personal stockpile triumph for me. Just don't ask me how many shelves are dedicated to our cheese and mil products right now! 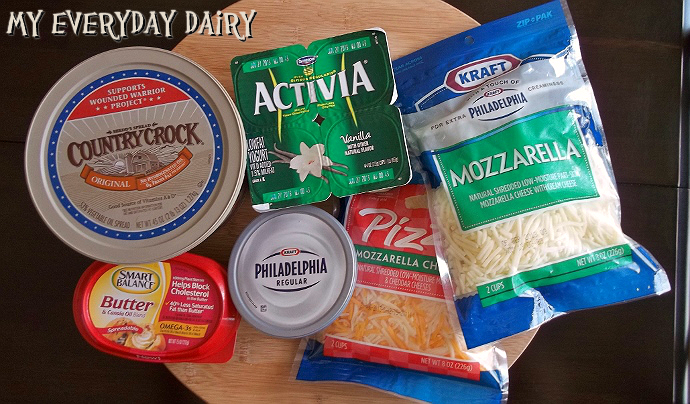 Naturally, with a dairy obsessed family like ours, I do have to get a little creative incorporating all these rich dairy products into healthy #EverydayDairy meals and snacks. 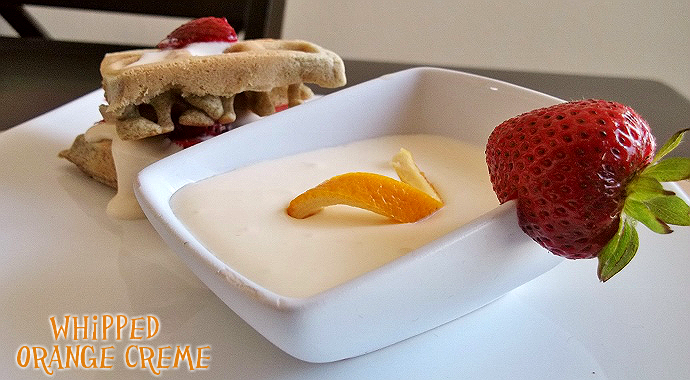 The key is to use your favorite dairy products to enhance the dish or snack, not serve as the main ingredient. 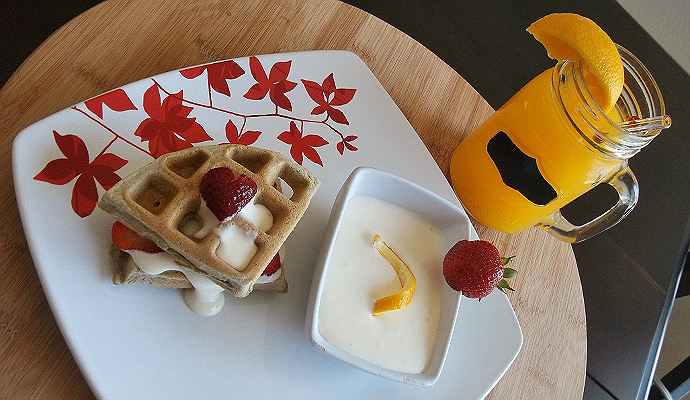 The past week we've been indulging in some of my personal favorite, and simple, dairy based recipes; beginning with a light and fluffy breakfast of Gluten Free Whole Grain Waffles and Whipped Orange Creme. You'll find my printable recipe for the Gluten Free Waffle batter is made entirely in the blender or food processor for a contained baking experience that is great for on-the-go mornings. 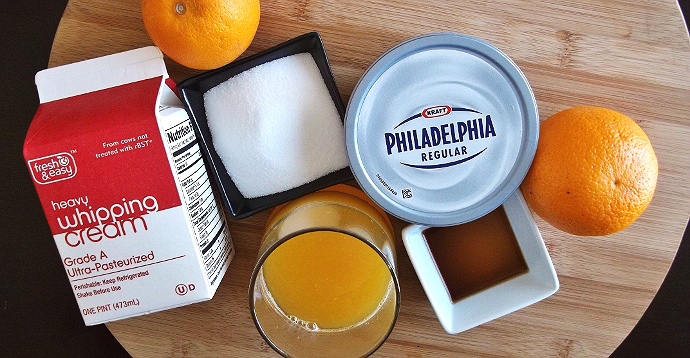 The Philadelphia Cream Cheese base in this Orange Creme leaves the texture silky, yet thick enough to dollop or whip much like that classic pie topping found in the freezer aisle. 1.) With the cream cheese still in the wrapper manipulate it until it becomes pliable. 3.) Add heavy cream and continue to whip until mixture resembles thick, softly whipped, cream cheese. 4.) Chill a minimum of 30 minutes prior to serving. Sometime last year on Pinterest I pinned a meal concept I was sure I'd never attempt, but knew my family would love. I say this because, well, I am odd about ground or processed meat, even if I am the one grinding it directly. It's a textural thing, really; I simply don't care much for sausage or 'patty' products. That being said, the concept of Baked Chicken Parmesan Minis was too much to pass up, and this has quickly become one of our family's favorite quick make meals for busy nights. Not only can these little mini 'meatloaves' be make in bulk in advance, but the little contained portions are great for snacking at lunch, or adding to a side of fresh steamed veggies for dinner. It's as simple as combing your favorite chicken Parmesan ingredients in a bowl, mashing by hand, then plopping the mixture into muffin tins to bake for 25 minutes. The result is one that won me over, and fills the house with an aroma to rival the finest Italian eatery. 1.) Lightly coat muffin tin with cooking spray and set aside. 2.) In a large bowl, combine ground chicken, egg, egg whites, breadcrumbs, basil, oregano, garlic, onion, salt, pepper and Kraft Parmesan and Mozzarella shredded cheeses and lightly mix together. Do not over handle. 3.) Form the meat mixture evenly into the 12 cups of your prepared muffin tin. Spread the pasta sauce evenly over the tops of each muffin. 4.) Bake for 20 MINS and remove from the oven. Top each muffin with about a tablespoon of shredded cheese/Shaved Parmesan and then return to the oven for 2-3 MINS until the cheese is melted. Garnish if desired. 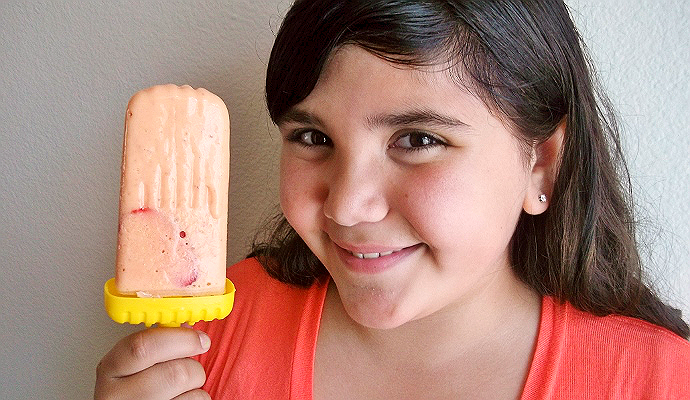 To round out our week of dairy indulgence I had Sabrina help me make some Orange Strawberry Creamsicle Pops. A while back we invested in a set of 6 generic popsicle molds for about $7 on Amazon to help get us through the hot Summer months with healthy frozen treats. Given my druthers I'd reach for a Drumstick to munch on every afternoon, but these creamy little popsicles have just enough dairy, thanks to Activia Vanilla Yogurt, to keep from getting icey and satisfy my cravings. As it turns out, it's also a great way ton incorporate all of the excess frozen strawberries we stockpile from our trips to the local Pick-Your-Own Farm. And, when we happen to have some fresh fruit on hand we slice them up thin and slide them down the sides of the molds for a little extra 'surprise' when eating. I've had plenty of trials and tribulations in home-made frozen pops, so let me impart my gem of wisdom onto you; when adding dairy into a frozen base, rely on frozen ingredients to keep the mixture from separating! 1.) 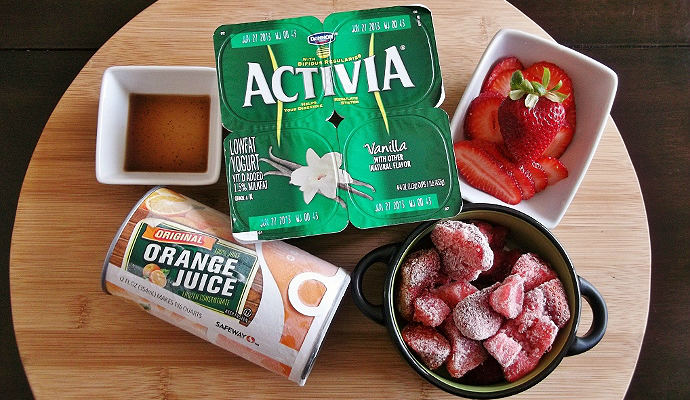 Combine all ingredients in blender and mix until evenly smooth. 2.) Pour into designated Popsicle molds, leaving 1/4" for any desired fruit slices. Whether we're whipping up a nutritious Italian inspired dinner, or cooling of poolside with homemade popsicles, great quality dairy from our favorite brands is a Summertime staple. 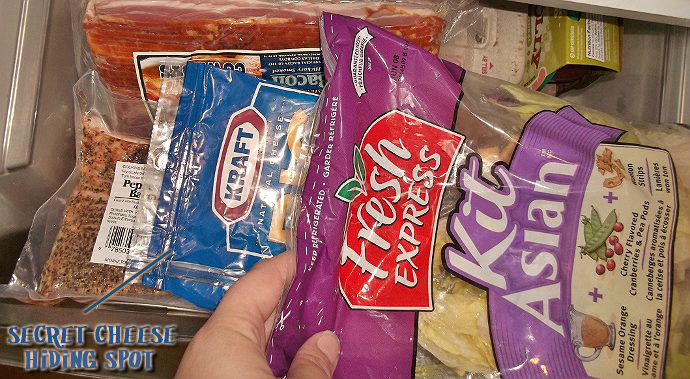 Buying delicious cheese and dairy products can be expensive for the ordinary family budget, but shoppers can take advantage of great savings and stock up on Kraft favorites all month long, thanks to promotional specials at their local Safeway chain. Visit our Google + album to see a sneak peek at some of the great savings in store this week, then head to your local Safeway location to create memorable dairy rich meals the whole family will love. What Daughter Says: We're a dairy addicted family, and proud! YUM! Pin, pin, pin. We love dairy too (except for my daughter.) I had to get a cheese stick after reading your post. 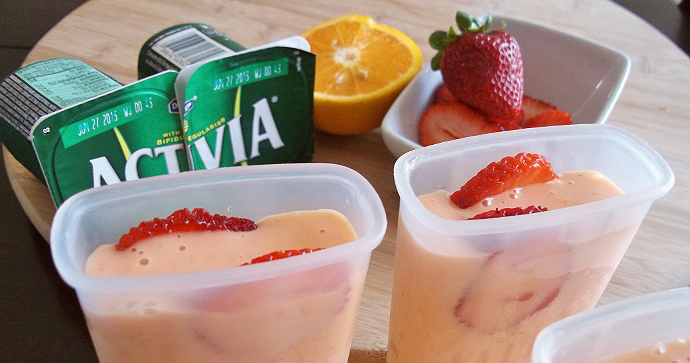 Such great recipes to get in 3 servings of dairy every day! Yum! Wow these all look amazing! I need to try several of them! I could not live without cheese. Mmmm. I make my own bagels but it's the Philadelphia cream cheese that makes them yummy! Oh dear Lord. I love dairy products - cheese and whipped cream being the two I cannot live without. I would love to do a paleo diet, but my mind shuts down at the thought of cutting out dairy, or even cutting back. Cheese makes even the most bland of foods taste better, and whipped cream......my refrigerator is always stocked with heavy whipping cream - I prefer whipped cream frosting over any other type! I could live without sweets but never ever without dairy. I love cheese, whipping creme..well you name it, I love it. Oddly thought, I don't drink milk! Oh yum. And my kids have been begging me to make some popsycles. 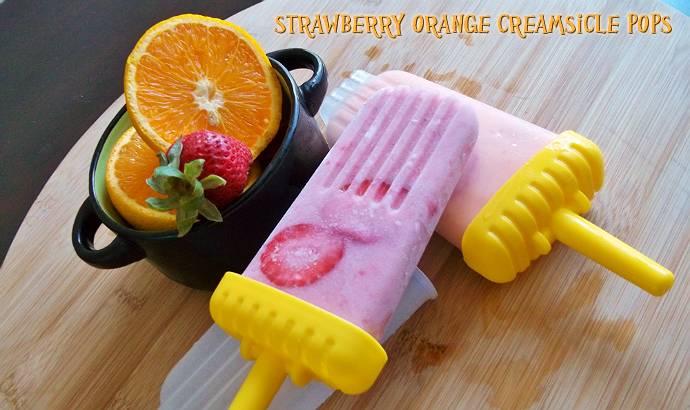 Love the Orange Strawberry Creamsicle pops! Delish! Wow these are great and easy recipes to try! Thanks for sharing! 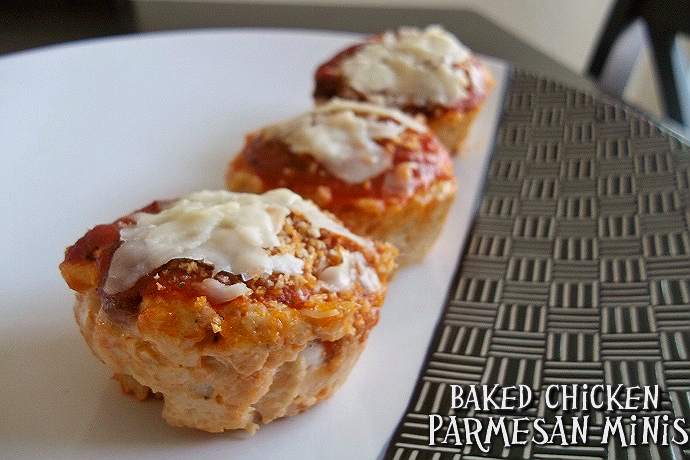 Oh, I must try the chicken parm minis! Awesome! ohh i wana try that baked chicken one! looks good!! Oh I am so drooling right now! I love those recipes and your pictures are so stunning! I would love to try the Whipped Orange Creme! And the popsicles are a given! Have to give those a try too! My goodness. How do you find the time to make all of these great recipes. 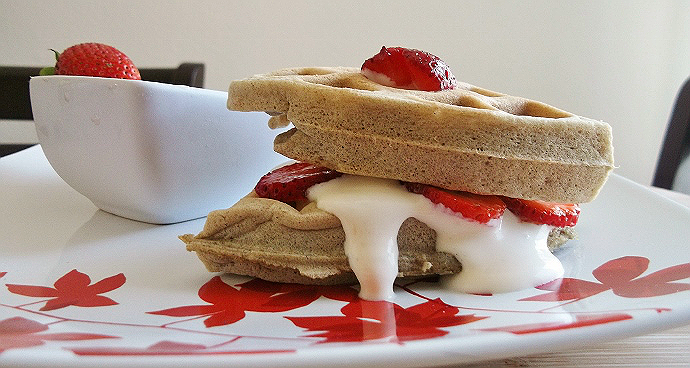 The waffles and cream look AMAZING!! I will make those pops for my kids too. Love all your recipes. They look so delicious! Those pops are adorable! i seriously need to come live with you lol you always have amazing looking food!